It’s no secret that Asheville is one of my very favorite cities. Between day trips and long weekends, we try to visit this gorgeous city as often as we can — usually a few times a year. With every visit I blog about I receive lots of messages asking about recommendations! So I thought I would create a city guide with all of our favorite places to stay, eat and play. You’ll notice that I don’t have a ton of recommendations for each category and that’s because we love to go back to the same places over and over and over again! Early Girl Eatery: Serves a wide variety of delicious southern dishes with made from scratch ingredients that are locally sourced. This restaurant has been featured in so many places — Southern Living, Bon Appetit, National Geographic Traveler, The New York Times and more. This is my second favorite place to eat breakfast. It used to be my favorite…until they discontinued the Early Girl Benny menu item. Tip: The wait is always very long. Grab a cup of their complimentary coffee after you put your name on the list and walk around downtown to check out all the street musicians and shops while you wait. Corner Kitchen: My favorite breakfast bistro located in Biltmore Village. The cream cheese scrambled eggs with fresh herbs and chives are unreal. And you can’t leave without enjoying a side of goat cheese grits. Over Easy Café: An adorable café in downtown with delicious breakfast options. Sunny Point Cafe: Several award winning dishes here! Get the shrimp & grits or the huevos rancheros (their specialty). Be prepared to wait a long time to be seated. Button & Co. Bagels: A new restaurant by Chef Katie Button. The thinly sliced country ham aged 18 months was out of this world. Buxton Hall Barbeque: An Eastern-style BBQ joint that roasts a whole hog for 18 hours every day. This restaurant has been featured in Huffington Post, Garden & Gun, Bon Appetit, Martha Stewart and more. The buttermilk fried chicken sandwich with pimento cheese has won many awards. White Duck Taco Shop: With more than a dozen taco choices to pick from, this restaurant serves creative and delicious a la carte tacos that you order from a counter and eat at a picnic table. Make sure to order the Bangkok Shrimp taco. The Admiral: One of my favorites! The Admiral is a cozy restaurant with less than 10 tables (books up fast) that has hundreds of outstanding reviews. However, when you first arrive you may think you’re at the wrong place. The cinderblock exterior of the restaurant screams “dive bar” for sure and is located between a junk yard and gas station. Despite the appearance of the outside, The Admiral is definitely every bit of 5 stars and serves up the best seared scallops, rib eye, beef tare tare and more. Cúrate: A Spanish tapas restaurant by James Beard finalist, Chef Katie Button. The ambiance is incredible and the food totally lives up to all the hype. Rhubarb: Award winning chef John Fleer’s downtown Asheville restaurant serving contemporary American cuisine including wood-fired dishes, plates made for sharing, house-baked breads, and other rustic creations. The menu is crafted daily, but check to see if the goat cheese burrata is available because it is out of this world! Tupelo Honey: A destination for scratch-made Southern food in Asheville. Also a delicious breakfast or lunch spot! Sovereign Remedies: The best spot for farm to table cuisine, fancy cocktails and late night food. Capella on 9: Located on top of the AC Hotel, this trendy rooftop bar features gorgeous mountain views, delicious cocktails and lots of comfortable lounging areas. Sunset Cocktail Terrace: My favorite place to sip a cocktail and watch the sun set. Burial: Last year this Burial was named the best craft brewery in Asheville. The outdoor space is pretty cool and they have live music. New Belgium Brewery: A national brewery located along the French Broad River in the River Arts District. This place is easy to camp out at for an afternoon with brewery tours, beer tastings, lawn games and more. Oh, and the beer is cheap! This is my favorite brewery. Green Man: A 3 story, 20,000 square ft. “brewtique” with an indoor/outdoor top floor taproom that overlooks production and the Blue Ridge Mountains! Highland Brewing Company: This brewery has it all — good beer, live music, large grassy meadow and a huge patio. Wicked Weed Brewing: This brewpub specializes in west coast style hoppy ales, open fermented belgian beers and barrel aged sours. The upstairs houses a full restaurant featuring 16 beers, a street level patio, tasting room, bottle shop, and original 15 barrel brewery. Oh, and they serve a super delicious bison burger. River Arts District: A really cool area of town to that consists of more than 200 artists and working studios in former industrial and historical buildings spread out along a one mile stretch of the French Broad River. Plan on spending some time visiting artists working in their studios, grabbing some tacos at White Duck Taco Shop and a brew at New Belgium! Asheville Brews Cruise: Definitely a fun way to sample several breweries! A huge yellow mustache school bus arrived to pick us up and our tour stopped at Pisgah, Highland, French Broad and HiWire breweries. All of them were fantastic and unique. At each brewery we received 4 ounce pours of 3-4 beers. This is such a fun activity for large groups too! Blue Ridge Parkway: Take a scenic drive along the Blue Ridge Parkway with the windows down, stopping at as many overlooks as you can! Triple Falls: Located in DuPont Forest, this 3 mile hike features 3 gorgeous waterfalls, one of which you can stand in the middle of! Make sure to bring a picnic or prosecco to enjoy on the flat rock plateau. If you arrive early enough, you’ll have the falls all to yourself. Craggy Pinnacle Trail: Only 24 miles from downtown Asheville, this fun 1.4-mile roundtrip hiking trail goes through tunnels of rhododendron, gnarled sweet birch trees and wildflowers. At the top there are the most beautiful panoramic mountain views. This is the easiest and closest hike we do near Asheville. AC Hotel: The best place to stay in downtown. It’s a trendy newer hotel that is super clean and modern, walkable to almost everything, offers easy parking and has an absolutely amazing rooftop bar. Omni Grove Park Inn: I’ve stayed here twice and think the rooms are expensive and underwhelming. However, the resort is gorgeous, the restaurants are delicious and the sunset terrace is one of my favorite places ever to spend an afternoon. But what really sets this place apart is the Spa, which is consistently voted as one of the top resort spas in the…world. During my last visit I splurged on a Mountain View Massage in an outdoor pagoda overlooking the Blue Ridge Mountains. Tip: Buy a day pass for the spa and spend some time on the Sunset Terrace, but save your pennies for a gorgeous room at The Biltmore Inn. Grand Bohemian Hotel: One of my favorite places to stay in Asheville. I love all of the details of this hunting lodge-inspired property and the service is always top notch. The Inn at Biltmore Estate: One of the prettiest places we’ve ever stayed with cozy places to sit inside. The large wrap-around porch offers unbelievable mountain views too! Tip: Spring for a mountainside view. It’s worth it. Asheville Glamping: Prefer to camp? Check out these glamorous camping sites. Dome 3 is legit! + Uber is very accessible anywhere you are. + Book your dinner reservations WELL in advance of your trip. + Use my search bar to find more info or pictures on any of these places. You can find my previous Asheville trip recaps HERE! Now, I know I have readers who are huge Asheville fans as well. Please share your recommendations in the comments below!! We are always on the hunt for new things to try! We went to the Grove Park for our "babymoon" and omg we stayed in the spa for a million hours and I never wanted to leave!! We love Asheville but sadly don't get to go as often as we'd like! I love Tupelo Honey and Early Girl Eatery! I'm totally pinning this post for the next trip!!! Sunny Point Cafe is great for breakfast (dog and kid friendly). Asheville Brewing Company not only has great beer but the food is awesome too. Love these recs. My sis lives in AVL and we've had a family house for over a hundred years nearby so Asheville is a family obsession. 🙂 Burial Beer is one of my favorites-very fun! My biggest addition to this list is 12 Bones BBQ-out of this world insanely good. Make sure to get the jalapeno cheese grits and the key lime pie (seriously-it's one of the very best key lime pies I've ever had). I love the smoked turkey BBQ in particular! 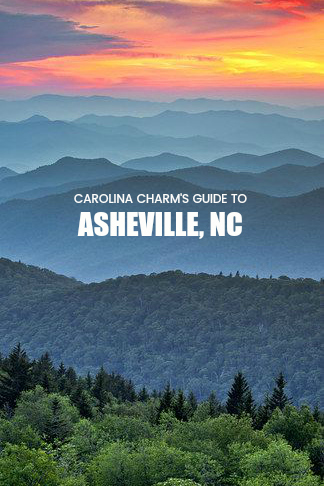 Well now….this post just makes me want to visit North Carolina! BTW- I'm totally with you on the Grove Park, not my fave. . .
Love this list! We flew down to Asheville last October for our 10 year anniversary. That's actual how I found your blog and started following you. I took some of your recommendations from your previous posts. This full list is great!! We hit up a few of these in our fun weekend, White Duck Taco and Tupelo Honey were 2 highlights. We did the Graveyard Fields hike on the Blueridge Parkway. It was great. Not super strenuous and beautiful waterfalls. We had our 1 year old with us (Left the big kids home with in-laws) and I hiked with her on my back the whole time. Can't wait to go back with the whole family and will come back to this list. Thanks! You have to stay at The Bunn House sometime! It is the most charming little bed and breakfast with a lot of history and super hospitable staff, plus walking distance to downtown! Around the property it has a green space for croquet and an outdoor seating area with music and a fire pit each night. There are only a few rooms so definitely need to book in advance! I also love Biscuit Head for breakfast! I was only able to spend one night there a few years ago but I'm pinning this because I would like to go back and explore! It seemed like a beautiful area! We LOVE Sierra Nevada in Mills River right nearby also, for both food and beer. And the grounds are AWESOME. Also we've been to Posana and Rezaz and both are incredible. Hi Wire is my favorite Asheville brewery, and Sunny Point Cafe is great for breakfast in West Asheville. Also, I've had two experiences staying at Asheville area B&Bs and both were amazing and so much fun with delish breakfast. Surprised you didn't mention Sierra Nevada. It's a HUGE hit for people coming from upstate SC..
Asheville is our top destination for this summer!!! Pinning this post for future planning! There’s a small restaurant closer to Biltmore called Fig Bistro where I had one of the best meals of my life. Also downtown there’s French Broad Chocolate Lounge. They have this sipping chocolate. It’s amazing. I love Asheville. Oooh, I need this for our next trip to Charleston — we've always wanted to stay in Asheville on the way over, but never knew what to do there! Great list! I love Double D's coffee (it's the one in the bus, can't miss it). I just learned that my very favorite cafe, Laurey's, closed in 2015. So sad! I love Asheville!!! When my hubby and I lived in NC, it was one of our favorite day trips. We got passes to the Biltmore and couldn’t go enough! Thanks so much for this guide, when we are able to visit again I am sure I will use it!